Xenia Sidorenko the designer behind the UseDem project, takes your old pair of jeans and magically bibbidi-bobbidi-boo's them to a trendy backpack, apron—really anything you want. This project's goal is to make us (society) think twice about what we throw away and watch how we consume in order to save resources like water, which turns out you need a lot of to make jeans. UseDem recently worked with Home Sweet Home to make aprons from recycled denim for the staff of Hunter Gatherer. We checked out a workshop a few weeks back to chat with Xenia and learn more. SmSh: What is UseDem? When, and why did you create it? Xenia: UseDem is a denim upcycle project. We upcycle jeans that are about to be thrown in the garbage into wearable and useful products. The core idea is to use one pair of jeans to produce one backpack. 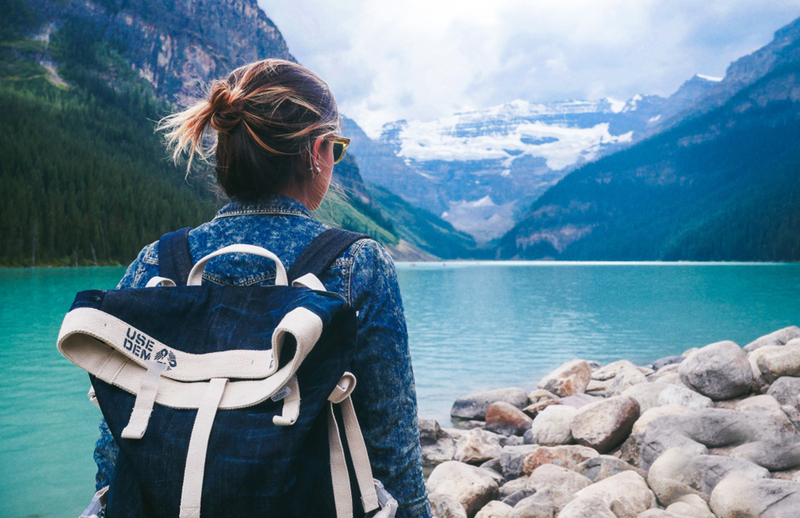 This way, your beloved jeans will stay with you on your adventures. But it's not just about producing bags...UseDem was created in 2015, back when I was working as denim designer/buyer in Shanghai. 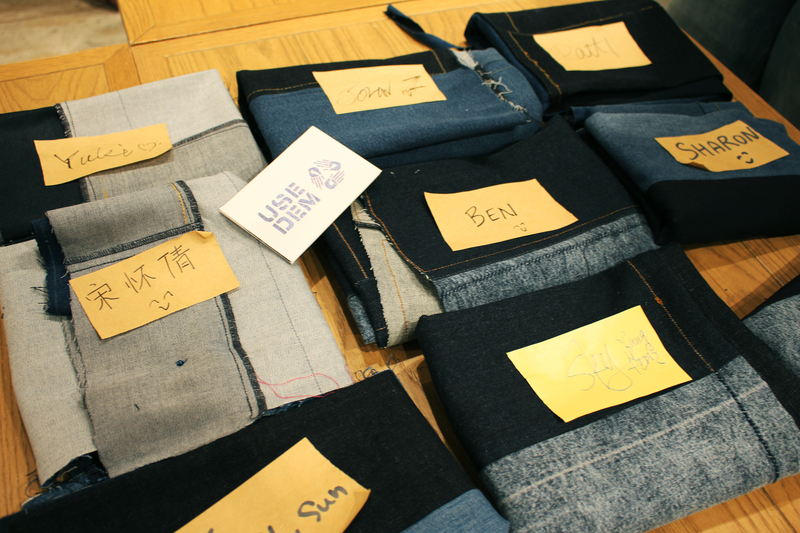 We shipped about 20,000 pairs of jeans each month just from China. It's unfathomable how fast consumers refurbish their wardrobe. But where do all those jeans come from? Where are they going to when we don't need them anymore? That was my turning point. I changed my mind to be a conscious designer. I went to dig up a better understanding of the denim industry's impact. What I found is that it takes approximately 6,800 liters of water to grow enough cotton for the production of just one pair of regular blue jeans! When you factor in the dye process as well as the machine wash, almost 12,000 liters of water are used. That’s a crazy amount of water for just one pair of jeans. it takes approximately 6,800 liters of water to grow enough cotton for the production of just one pair of regular blue jeans! When you factor in the dye process as well as the machine wash, almost 12,000 liters of water are used. SmSh: Can you walk us through the process of how one backpack is made? Xenia: For each customer we offer to help them cut their jeans and be part of the process. We aim to make this bag and relationship last a lifetime. Those who choose this option get the special "Made By Me" tags on it. Just one pair of jeans is enough to produce one bag. The size of the bag depends on the size of the jeans. After cutting we send the pieces of jeans to the workshop, where according to the unique size and shape, a worker will cut the remaining layers of your bag. 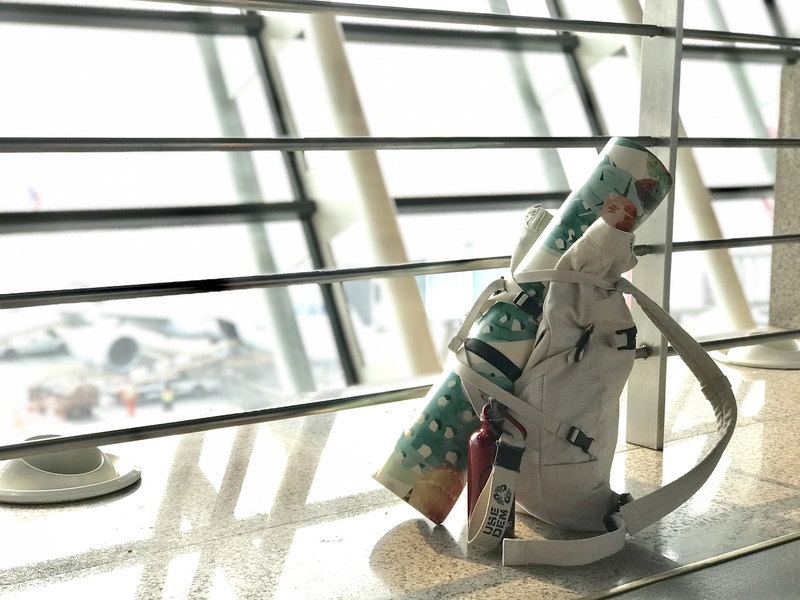 For now 50% of the materials inside the backpack are recycled from plastic bottles (the lining makes our bags water resistant). All items are produced in cooperation with the Chinese retired and disabled community. We work primarily with an organization called Home Sweet Home that provides people in need with the support and training necessary to become employable, as well as a job­. Home Sweet Home, where the sewing happens! SmSh: What’s going on with Hunter Gatherer? Can you do the same thing with other companies? Xenia: UseDem is up-cycling fabric leftovers from factories into aprons for the Hunter Gatherer team. With every apron that is made from pre-existing fabric we have saved about 10,000 litres of water. Isn’t that fantastic? This project has been done primarily in cooperation with Home Sweet Home; so to be able to also create work for the community through this project makes us even more proud. This is about industry transformation, so that everyone can benefit and grow through this collaboration. We are very open to collaborate with other companies and chase goals together working towards sustainable and ethical business. UseDem can use textile waste, products that didn’t pass quality control in the factory, and leftover textile stock from shops. Each brand receives a unique story, and a unique product to present to customers. SmSh: There are also workshops, what happens there? Are they just for aprons and backpacks or can people make their own…anything? 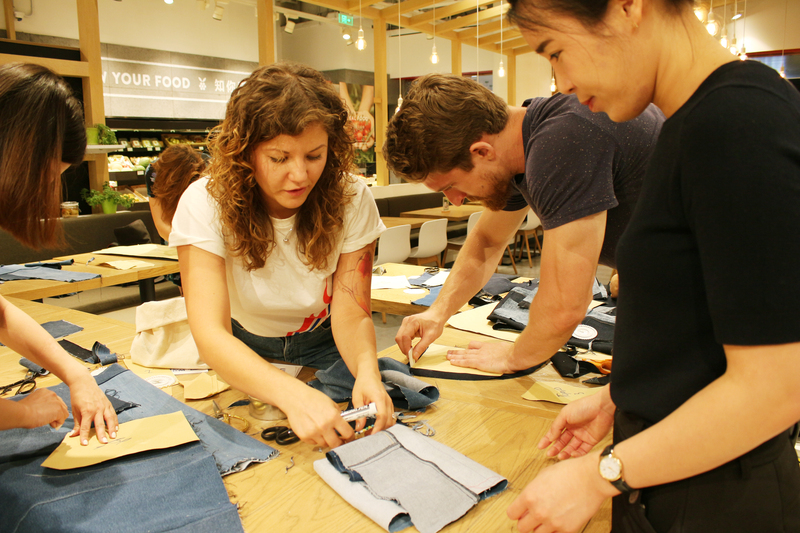 Xenia: With the Hunter Gather team we did a workshop to up-cycle fabric waste into aprons. However we do workshops where we teach participants to up-cycle their own jeans into a bag, a backpack and other items. I also give personal up-cycle workshops. In the first class we clean out your wardrobe and select the clothes that we can give a new life through up-cycling. In the next classes we sew, reshape and, modify styles. Clothes that were forgotten or out of fashion become trendy again and full of new life. I am very strict in those workshops, you can tell me no only 3 times when we are de-cluttering wardrobes. It sounds harsh, but all my clients are very happy at the end of transformation! SmSh: Where can people purchase UseDem products? Xenia: WeChat: UseDem御丹 and if very special order contact us by email weare@usedem.com. You can help make your own or you can buy ready-made bags that we produce from jeans that have been donated from factories, people, and charities. UseDem's Official website launching soon, check it out here.